From left: David Kim, Kim Cheon-Woong, Brahim Ouarets, Amb. Boutache, Amar Tou, Kwaak YoungHoon, Jeremy Y. Ha, Kang Young-Won, and Yeo Seok-Koo. 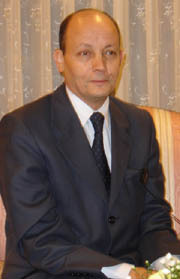 Algerian Amb. 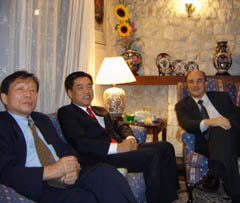 Ahmed Boutache hosted a dinner and reception in honor of Minister Amar Tou of Algeria's Post and Information and Communication Technologies Ministry and his delegation at his Sungbuk-dong residence in Seoul on Sept. 9, 2004. Among his delegates was Brahim Ouarets, president and CEO of Algeria Telecom (AT), who signed a memorandum of understanding (MOU) with local companies including KT (Korea Telecom) and Daewoo International. Minister Tou attended ITU (International Telecommunication Union) Telecom Asia 2004 opened at the BEXCO (Busan Exhibition and Convention Center) in Busan, Sept. 6 for a three-day run. 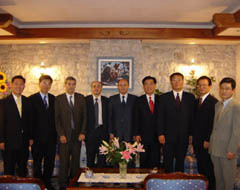 Minister Amar Tou came to Seoul on Sept. 6, 2004 at the invitation of Information and Communication Minister Chin, Dae-Je. He left Seoul on Sept. 10 after attending ITU (International Telecommunication Union) Telecom Asia 2004 held in Busan on Sept. 6. Among those who attended the function included Kang Young-Won, vice president of Daewoo International, Kim Cheon-Woong, director of Global Broadband Business Team of Korea Telecom, David Kim, chairman of Westech Korea Inc.
Other leading businessmen included Kwaak YoungHoon, president of World Citizens' Organization, Yeo Seok-Koo, director of Daewoo International's Business Development Team Leader, and Jeremy Y. Ha, president and CEO of Corecess Inc. in Korea. Minister Tou and Brahim Ouarets, president and CEO of Algeria Telecom spoke very highly of Korea's ongoing drive to commercialize the CDMA technology for the first time in the world and its unrivaled position in the CDMA mobile phone market. Dr. Kwaak YoungHoon (center), president of World Citizens' Organization, poses with Amb. Boutache (right) and Mr. Min Byung-Il, editorial director of The Seoul Times. "That is why we have signed MOUs with KT and Daewoo International while here to diversify Algerian mobile phone and Internet service," he said.